Mackenzie began work on his Violin Concerto in C sharp minor, Op 32, in the middle of June 1884 while still resident in Tuscany at the castle of Borgo alla Collina, Casentino, not far from Florence. This was a period of intense creativity in Mackenzie’s career. He had left his teaching practice in Edinburgh on doctor’s orders, deciding to live abroad and devote his time to composition. Most of his mature works date from this Florentine period. The Violin Concerto was written as the result of a commission from the Birmingham Festival of 1885. He had originally been asked to supply a choral piece but work on his oratorio The Rose of Sharon for the 1884 Norwich Festival prevented him from consenting to such an undertaking. At the same time he was also engaged in writing the first act of his second grand opera, The Troubadour, commissioned by the Carl Rosa Opera Company for their 1886 season. The opportunity to work on a musical project such as a concerto alone and without a librettist absolved Mackenzie of the usual worry he felt when dealing with collaborators in his dramatic and choral works. Also, much of his early reputation rested not on his choral and operatic output but rather on his orchestral studies such as the two Scotch Rhapsodies (1879 and 1880) and the orchestral ballad La belle dame sans merci (1883). In the end Joachim did not consent to play the work, although it is difficult to know why this was. Mackenzie notes that Joachim was in the process of going through a divorce which may have preoccupied him, but the violinist procrastinated for a remarkably long time before delivering his decision. However, a few years earlier Joachim had treated Dvorák in a similar manner, keeping the manuscript of his A minor Concerto (1879) for over two years before telling the composer that he would not play it and thus delaying the premiere of the work until 1883. Joachim’s decision must have dented Mackenzie’s confidence and also tried his patience, since he still had to find another violinist to premiere the work with only five months remaining before the Birmingham performance. ‘I have never expected Joachim to play the Concerto therefore it is no disappointment to me’, wrote Mackenzie to Littleton, trying to conceal his indignation after he had received the violinist’s reply. Quite probably Mackenzie had depended on his friendship with Joachim to secure the performance of the Violin Concerto at Birmingham. It is perhaps somewhat ironic therefore that Pablo de Sarasate, with whom he was completely unacquainted, should have agreed to play the work without hesitation and with little time to spare before the Festival in August. As a result the concerto which might have borne Joachim’s name was instead dedicated to Sarasate. The nineteenth century had a growing preoccupation with the cult of the instrumental virtuoso. Both the Austro-Hungarian Joseph Joachim (1831–1907) and the Spaniard Pablo Martín Melitón de Sarasate y Navascuéz (1844–1908, less formally known in later years as Pablo de Sarasate) were prime exponents of different schools of violin playing (the German and the French respectively). Himself a composer and author of a violin concerto (the ‘Hungarian’ Concerto Op 11 of 1861), Joachim favoured a classical approach to the genre that had been spearheaded by Brahms. Indeed, as if to underline the aesthetic consensus between the two men, Brahms composed his Violin Concerto in D major Op 77 for Joachim in 1878. In general Joachim’s style of playing favoured a more cerebral stance that eschewed mere virtuoso display. It is no surprise, for example, that for his encores he preferred to play Bach rather than traditional showpieces. On the other hand, Sarasate favoured technical fireworks and glorious melodic lines which would best exhibit his perfect intonation and pure, sweet tone. As a young man he trained at the Paris Conservatoire, winning the premier prix in violin at the age of seventeen, and considered himself to be more of a Frenchman than a Spaniard, though he never lost his love for his native town, Pamplona. A large amount of concerted violin music was written for Sarasate to perform on his subsequent concert tours both in Europe and the Americas, including works by Saint-Saëns (Concertos Nos 1 and 3 of 1863 and 1880, and the Introduction and Rondo capriccioso of 1863), Bruch (Concerto No 2 of 1877 and the Scottish Fantasy of 1880) and Lalo (Concerto in F major of 1872 and the Symphonie espagnole of 1873). Sarasate’s approach to the genre of the violin concerto was that of a man whose instinctive musicianship outweighed all other considerations, allowing, as Mackenzie noted, his ‘natural ease and grace, without a trace of self-consciousness or affectation’ to shine through. 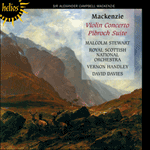 Mackenzie’s concerto presents a fusion of both French and German schools of violin playing. Although certain Germanic elements of harmony and form are evident (Mackenzie had Joachim in mind during the work’s conception), there is also something more technically extrovert in the music that clearly emanates from the sensibility of the French school, which would have appealed greatly to Sarasate. In the first movement, it is possible to see Mackenzie’s idiomatic and unusual handling of traditional sonata form. After the introduction of a dark and brooding theme in the home key of C sharp minor, the music moves to the relative key of E major for a broader second subject group. With the conclusion of the exposition, Mackenzie embarks upon a cadenza for the violin instead of the customary development. This unconventional process is typical of Mackenzie’s interpretation of the sonata principle which can be observed in other works such as the later Scottish Concerto for piano of 1897 (recorded on Hyperion CDA67023). The idea of a central cadenza for the soloist finds a precedent in Mendelssohn’s famous Violin Concerto in E minor (1844), although in that instance Mendelssohn does use a conventional development section beforehand. Mackenzie’s uncomplicated structure gives the movement a conciseness and lack of discursiveness that may have appealed more directly to the extrovert Sarasate than to the cerebral Joachim, possibly explaining the latter’s lack of affinity with the work. The Largo is a lyrical ternary movement in A major which concentrates on questions and answers between the orchestra and the soloist, giving the latter ample opportunity for the expansion and decoration of motifs. Rather than present the soloist with the hazardous, not to say unidiomatic, key of C sharp major for the Finale, Mackenzie opted for E major. The fact that the movement is couched in the relative major creates a sense of unusual exuberance, one that is heightened through its juxtaposition with the slow movement in A major. Following in the tradition of the Brahms Violin Concerto, where Hungarian dance rhythms are employed in the last movement, Mackenzie’s Finale is based on the Polish dance, the krakowiak (as identified by Dr John Purser). After a short orchestral introduction the violin plays the main theme, with its distinctive syncopated krakowiak rhythm in the key of E major, which returns at intervals throughout the movement. ‘Je suis myope’ was his excuse for propping up the manuscript on the mantelpiece while I took my seat at the other end of the room. Nevertheless his short-sightedness did not prevent him either from dealing easily with the technical difficulties or from entering into the spirit of the piece a prima vista […] After the final chord there followed—for me—a somewhat embarrassing silence. Then he held out his hand, remarking, to my great relief, ‘Je n’ai rien à dire, rejouons-le encore’, from which I was shrewd enough to gather that he had expected to have a great deal to say. The concerto was premiered at the Birmingham Festival on the evening of 26 August 1885 conducted by the composer. The work was well received by the reviewer in The Musical Times who noted the ‘magnificent playing of Señor Sarasate’ and the ‘warmest marks of approbation’ given to Mackenzie. The composer notes in his autobiography that to this event ‘I owe the beginning of a friendship which lasted until his death’. Mackenzie commença son Concerto pour violon en ut dièse mineur op. 32 à la mi-juin 1884, alors qu’il résidait encore au château toscan de Borgo alla Collina, à Casentino, non loin de Florence. Contraint par son médecin de quitter ses activités professorales d’Édimbourg, Mackenzie avait décidé de vivre à l’étranger pour se consacrer à la composition. Il en résulta une période de créativité intense, source de la plupart de ses œuvres abouties. Le Concerto pour violon en ut dièse mineur fut écrit en réponse à une commande du Birmingham Festival de 1885. La commande initiale portait sur une pièce chorale, mais son oratorio The Rose of Sharon, pour le Norwich Festival de 1884, empêcha Mackenzie de consentir à pareille entreprise, d’autant qu’il était également occupé à composer le premier acte de son deuxième grand opéra, The Troubadour, commandé par la Carl Rosa Opera Company pour sa saison 1886. L’occasion de travailler à un projet musical comme un concerto seul, sans librettiste, affranchit Mackenzie de l’habituelle inquiétude ressentie avec les collaborateurs de ses œuvres dramatiques et chorales. En outre, une grande partie de sa réputation de jeunesse reposait non sur ses productions chorales et opératiques, mais sur ses études orchestrales, telles les deux Scotch Rhapsodies (1879 et 1880) et la ballade orchestrale La belle dame sans merci (1883). Bien qu’il mît six mois à conclure son Concerto, Mackenzie esquissa les deux premiers mouvements au cours du premier mois. Le troisième mouvement fut, cependant, sa principale source de problèmes, tandis que diverses interruptions ralentirent l’achèvement du concerto en grande partition. En octobre 1884, il alla assister à la production de The Rose of Sharon, à Norwich—œuvre qui remporta un important succès critique et se révéla un tournant majeur dans la carrière du compositeur. La pression engendrée par l’écriture du Concerto pour violon fut exacerbée par la nécessité de trouver un soliste pour la première de l’œuvre, à Birmingham. Mackenzie écrivit tout d’abord à Joseph Joachim, en novembre 1884, lui demandant de jouer le concerto, mais il ne reçut pas de réponse immédiate. Au bout de quelques semaines, il rédigea une seconde lettre, accompagnée de copies des deux premiers mouvements et reprenant le thème du Finale, qu’il promit d’envoyer une semaine plus tard—une promesse apparemment fort optimiste: «Je passerai probablement un temps certain sur le Finale», se complaignit-il, au début de 1885, dans une lettre adressée à Alfred Littleton, directeur des publications chez Novello (qui édita par la suite le concerto). Une fois l’esquisse achevée, le compositeur prévoyait encore des difficultés dans la révision du Finale, mais les deux premiers mouvements avaient déjà subi quelques changements nécessaires. Fier de son travail sur les sections terminées, il nota: «J’imagine que l’on trouvera le premier mouvement assez difficile quand on l’entendra dans sa globalité, même s’il n’est pas aussi colossal que cela—il est, à mon sens, aussi difficile que le concerto, tant joué, de Bruch [no 1 en sol mineur]». Finalement, Joachim ne consentit pas à jouer cette œuvre, sans que l’on sache vraiment pourquoi. Mackenzie remarque que Joachim était en train de traverser un divorce, qui le préoccupait peut-être. Quoi qu’il en fût, le violoniste atermoya fort longtemps avant de rendre sa décision. Quelques années plus tôt, il avait déjà traité Dvovák de la sorte, conservant le manuscrit de son Concerto en la mineur (1879) pendant plus de deux ans avant de lui annoncer qu’il ne le jouerait pas—repoussant ainsi la première de l’œuvre à 1883. La décision de Joachim dut entamer la confiance de Mackenzie et éprouver sa patience, car il lui fallut trouver un autre violoniste, à cinq mois seulement de la première à Birmingham. «Je n’ai jamais cru que Joachim jouerait le Concerto, aussi ne suis-je point déçu», écrivit-il à Littleton, tentant de masquer l’indignation née de la réponse du violoniste. Mackenzie avait très probablement espéré que Joachim exécuterait son Concerto pour violon à Birmingham au nom de leur amitié. Non sans une légère ironie, ce fut un interprète qu’il ne connaissait absolument pas—Pablo de Sarasate—qui accepta sans hésitation de jouer l’œuvre, très peu de temps avant le festival, en août, et devint le dédicataire du concerto qui aurait dû porter le nom de Joachim. Le XIXe siècle s’intéressa de plus en plus au culte des instrumentistes virtuoses. L’Austro-Hongrois Joseph Joachim (1831–1907) et l’Espagnol Pablo Martín Melitón de Sarasate y Navascuéz (1844–1908, moins formellement connu, plus tard, sous le nom de Pablo de Sarasate) furent des représentants majeurs des différentes écoles de jeu violonistique (respectivement l’allemande et la française). Lui-même compositeur et auteur d’un concerto pour violon (le Concerto «hongrois», op. 11, de 1861), Joachim favorisa une approche classique du genre dont Brahms avait été le fer de lance. Bien plus, et comme pour souligner le consensus esthétique qui les unissait, ce dernier composa à l’intention de Joachim le Concerto pour violon en ré majeur, op. 77 (1878). Dans l’ensemble, le style de jeu de Joachim encouragea une attitude plus cérébrale, fuyant l’exhibition virtuose pure. Aussi n’est-il pas surprenant qu’il préférât, par exemple, jouer Bach pour ses bis plutôt que pour ses pièces traditionnelles. A contrario, Sarasate privilégia les feux d’artifice techniques et les lignes mélodiques éclatantes, à même d’exhiber au mieux son intonation parfaite et son ton doux, pur. Formé au Conservatoire de Paris, récompensé par le premier prix de violon à dix-sept ans, il se considéra davantage comme français que comme espagnol, même s’il ne perdit jamais son amour pour sa ville natale, Pampelune. Moult pièces de concert pour violon furent composées pour que Sarasate les interprétât lors de ses tournées en Europe et dans les Amériques—citons, par exemple, des œuvres de Saint-Saëns (concertos no 1 et no 3 de 1863 et 1880, Introduction et Rondo capriccioso de 1863), de Bruch (Concerto no 2 de 1877 et Fantaisie écossaise de 1880) et de Lalo (Concerto en fa majeur de 1872 et Symphonie espagnole de 1873). Sarasate appréhendait le concerto pour violon comme un homme dont la musicalité prime sur toutes les autres considérations, laissant percer, pour reprendre les propos de Mackenzie, son «aisance et sa grâce naturelles, sans la moindre trace de style appuyé ou d’affectation». Le concerto de Mackenzie présente une fusion des écoles de jeu violonistique allemande et française. Nonobstant certains éléments harmoniques et formels manifestement allemands (Mackenzie conçut l’œuvre en pensant à Joachim), la musique recèle quelque chose de techniquement plus extroverti, qui émane clairement de la sensibilité de l’école française—et avait énormément plu à Sarasate. Le premier mouvement nous révèle la manière idiomatique et inhabituelle dont Mackenzie traite la forme sonate traditionnelle. Passé l’introduction d’un thème sombre et menaçant, sis dans la tonalité mère d’ut dièse mineur, la musique se meut jusqu’à la tonalité relative de mi majeur pour un second groupe thématique plus vaste. Avec la conclusion de l’exposition, Mackenzie s’embarque sur une cadence pour le violon, préférée au développement d’usage. Ce processus peu conventionnel est typique de son interprétation du principe de la sonate, perceptible dans d’autres œuvres, tel son Scottish Concerto pour piano (enregistré sur le disque Hyperion CDA67023), plus tardif (1897). L’idée d’une cadence centrale pour le soliste trouve un précédent dans le célèbre Concerto pour violon en mi mineur (1844) de Mendelssohn, quoique ce dernier utilise au préalable une section de développement conventionnelle. La structure simple de Mackenzie confère au mouvement une concision et une absence de discursivité qui ont peut-être séduit plus directement l’extroverti Sarasate que le cérébral Joachim—ce qui pourrait expliquer le manque d’affinité de celui-ci pour l’œuvre. Le Largo, un lyrique mouvement ternaire en la majeur, se concentre sur des questions/réponses entre l’orchestre et le soliste, auquel il offre une ample opportunité d’expansion et de décoration motiviques. Pour le Finale, Mackenzie préféra épargner au soliste la tonalité hasardeuse, pour ne pas dire non idiomatique, d’ut dièse majeur, et opta pour le mi majeur. Le fait que ce mouvement soit formulé dans le majeur relatif crée une sensation d’exubérance insolite, rehaussée par sa juxtaposition avec le mouvement lent en la majeur. Dans la tradition du Concerto pour violon de Brahms, qui utilise des rythmes de danse hongrois dans le dernier mouvement, Mackenzie fonde son Finale sur une danse polonaise, la cracovienne (comme l’a démontré le Dr John Purser). Après une brève introduction orchestrale, le violon joue le thème principal, avec son distinctif rythme de cracovienne syncopé, en mi majeur, qui jalonne tout le mouvement. «Je suis myope», s’excusa-t-il en appuyant le manuscrit sur la tablette de la cheminée pendant que je m’asseyais à l’autre bout de la pièce. Néanmoins, sa myopie ne l’empêcha ni de traiter aisément les difficultés techniques, ni d’entrer a prima vista dans l’esprit du morceau … L’accord final fut suivi—pour moi—d’un silence quelque peu embarrassant. Puis il me tendit la main et déclara, à mon grand soulagement: «Je n’ai rien à dire, rejouons-le encore»; je fus assez perspicace pour en déduire qu’il s’était attendu à avoir beaucoup de choses à dire. La première du concerto se déroula au Birmingham Festival, le 26 août 1885 au soir, sous la direction du compositeur. L’œuvre fut très bien accueillie par le critique de The Musical Times, qui remarqua le «magnifique jeu du Señor Sarasate» et les «marques d’approbation fort chaleureuses» données à Mackenzie. Et le compositeur de noter dans son autobiographie: «Je dois [à cet événement] le début d’une amitié qui dura jusqu’à sa mort». Mackenzie begann Mitte Juni 1884 an seinem Violinkonzert in cis-Moll op. 32 zu arbeiten, zu der Zeit als er noch in der Toskana auf der Burg von Borgo alla Collina in Casentino—nicht weit von Florenz—residierte. Dieser Abschnitt war von einer immensen Kreativität im Leben Mackenzies gekennzeichnet. Auf Anordnung seines Arztes legte er sein Lehramt in Edinburgh nieder und entschloß sich, ins Ausland zu ziehen, um sich vollends seinen Kompositionen zu widmen. Viele seiner reiferen Werke datieren aus seiner Florentiner Zeit. Das Violinkonzert in cis-Moll resultierte aus einem Auftrag für das Musikfestival von Birmingham im Jahre 1885. Ursprünglich bat man ihn, ein Chorstück zu schreiben; die Arbeit an seinem Oratorium The Rose of Sharon für das Norwich Festival von 1884 hielt ihn aber vom Eingehen einer solchen Verpflichtung ab. Zur selben Zeit war er bereits mit der Komposition des ersten Aktes seiner zweiten großen Oper The Troubadour beschäftigt, mit der ihn die Carl Rosa Opera Company für die Spielzeit 1886 beauftragte. Die Gelegenheit, an einem musikalischem Projekt wie einem Konzertstück ganz allein und ohne Librettisten zu arbeiten, entband Mackenzie von den sonst üblichen Sorgen im Umgang mit anderen bei der Komposition seiner Theater- und Chorstücke. Sein früher Ruf beruhte nämlich nicht so sehr auf seinen Werken im Bereich der Chormusik oder der Oper, sondern vielmehr auf seinen Orchesterstudien, wie den beiden Scotch Rhapsodies (1879 und 1880) und der Orchesterballade La belle dame sans merci (1883). Joachim erklärte sich schließlich nicht bereit, das Stück zu spielen—warum dies so war, bleibt allein der Spekulation überlassen. Mackenzie bemerkte hierzu, daß Joachim wohl zu sehr damit beschäftigt war, über seine Scheidung hinwegzukommen; er zögerte allerdings erstaunlich lange bis er seine Entscheidung bekannt gab. Einige Jahre zuvor verfuhr Joachim bereits mit Dvorák auf ähnliche Weise, als er das Manuskript für dessen Konzert in a-Moll (1879) zwei Jahre zur Ansicht behielt, um dem Komponisten letztendlich mitzuteilen, daß er es nicht spielen werde, womit sich die Premiere bis 1883 verzögerte. Joachims Entscheidung muß Mackenzies Vertrauen wohl erschüttert und seine Geduld auf die Probe gestellt haben, da er nun nur noch fünf Monate Zeit hatte, um bis zur Uraufführung des Werkes in Birmingham einen neuen Geiger ausfindig zu machen. „Ich habe sowieso nie damit gerechnet, daß Joachim das Konzert spielen wird, es ist deshalb für mich überhaupt keine Enttäuschung“, schrieb Mackenzie an Littleton, in einem Versuch, seine Entrüstung über dessen Absage zu verbergen. Es ist sehr wohl möglich, daß sich Mackenzie zur Rettung der Aufführung des Violinkonzertes in Birmingham auf seine Freundschaft zu Joachim berief. Es ist fast schon ein bißchen paradox, daß sich ausgerechnet Pablo de Sarasate, der ihm völlig unbekannt war, so kurz vor dem Festival im August ohne zu zögern dazu bereit erklärte, das Werk aufzuführen. Dies führte dazu, daß das Konzert, das Joachims Namen hätte tragen können, nun statt dessen Sarasate gewidmet wurde. Im neunzehnten Jahrhundert befaßte man sich in zunehmenden Maße mit dem Kult um den Virtuosen. Zwei Musterbeispiele für die unterschiedliche Schule des Geigenspiels (die deutsche bzw. französische) sind der aus Österreich-Ungarn stammende Joseph Joachim (1831–1907) sowie der Spanier Pablo Martín Melitón de Sarasate y Navascuéz (1844–1908, in späteren Jahren auch unter dem weniger formellen Namen Pablo de Sarasate bekannt). Joachim, selbst Komponist und Urheber eines Violinkonzerts (dem „Ungarischen“ Konzert, op. 11, 1861), bevorzugte eine eher klassische Annäherung an das von Brahms bestimmte Genre. Es wirkt fast schon so, als ob Brahms die ästhetische Übereinstimmung mit Joachim besonders betonen wollte, als er 1878 sein Violinkonzert in D-Dur, op. 77, speziell für ihn komponierte. Joachims Stil verkörperte im allgemeinen eine eher geistige Haltung, die eine lediglich virtuose Darbietung vermied. Es ist daher auch nicht verwunderlich, daß er als Zugabe oft Bach spielte anstatt traditioneller Showstücke. Im Gegensatz dazu bevorzugte Sarasate technische Feuerwerke und herrlich melodische Linien, die für seine perfekte Intonation und den reinen, süßen Ton am besten geeignet waren. Als junger Mann studierte er am Pariser Konservatorium, wo er im Alter von siebzehn Jahren mit dem premier prix für Violine ausgezeichnet wurde, und sah sich selbst mehr als Franzose denn als Spanier, wobei er aber nie die Liebe zu seiner Heimatstadt Pamplona verlor. Für Sarasates Konzerttourneen durch Europa, Nord- und Südamerika wurde eine Reihe von Violinkonzerten geschrieben, darunter Werke von Saint-Saëns (Konzerte Nrn. 1 und 3 von 1863 und 1880, sowie die Einleitung und Rondo capriccioso von 1863), Bruch (Konzert Nr. 2 von 1877 und die Schottische Phantasie von 1880) und Lalo (Konzert in F-Dur von 1872 und Symphonie espagnole von 1873). Sarasates Umgang mit dem Genre Violinkonzert zeigt, wie sein musikalisches Können alle anderen Aspekte der Betrachtung in den Schatten stellte, womit seine „natürliche Leichtigkeit und Anmut ausgedrückt wird“, wie Mackenzie feststellte, „ganz ohne einer Spur von Befangenheit oder Affektiertheit“. Mackenzies Violinkonzert stellt eine Verschmelzung der französischen mit der deutschen Schule dar. Man findet darin ganz eindeutig deutsche Harmonie- und Formelemente (Mackenzie dachte bei der Konzeption an Joachim), doch ebenso sind technisch extrovertierte Aspekte der Musik vorhanden, die ihren Ursprung ganz klar in der Sensibilität der französischen Schule haben, die Sarasate offensichtlich sehr gut gefallen hat. Im ersten Satz erkennt man Mackenzies ungewöhnlichen, idiomatischen Umgang mit der herkömmlichen Form der Sonate. Nach der Einleitung mit einem dunklen, nachdenklichen Thema in cis-Moll geht die Musik in die parallele Tonart E-Dur zu einer breiteren, zweiten Themengruppe über. Zum Ende der Themenaufstellung wählt Mackenzie eine Violinkadenz anstatt der sonst gewöhnlichen Verarbeitung. Dieses unkonventionelle Vorgehen ist charakteristisch für Mackenzies Interpretation des Grundsatzes der Sonate; dies läßt sich auch in anderen Werken beobachten, so zum Beispiel im späteren Scottish Concerto für Klavier (1897). Die Idee einer mittleren Kadenz für den Solisten findet man bereits in Mendelssohns berühmten Violinkonzert in e-Moll (1844), wenn er auch in diesem Fall eine herkömmliche Verarbeitung des Abschnittes zuvor verwendet. Mackenzies unkomplizierter Aufbau verleiht dem Satz eine Präzision und Deutlichkeit, die beim extrovertierten Sarasate wohl eher Anklang fand als beim intellektuellen Joachim, womit auch wohl dessen fehlendes Interesse an der Arbeit geklärt wäre. Das Largo ist ein dreiteiliger, lyrischer Satz in A-Dur, der aus einem Frage- und Antwortspiel zwischen Orchester und Solist besteht, wobei letzterem umfangreich Gelegenheit zur Ausdehnung und Verzierung der Motive geboten wird. Und anstatt dem Solisten die riskante, um nicht zu sagen unidiomatische, Tonart in Cis-Dur vorzusetzen, wählte Mackenzie E-Dur. Die Tatsache, daß der Satz in der parallelen Durtonart gehalten ist, erzeugt ein Gefühl ungewöhnlicher Überschwenglichkeit, welches durch die Nebeneinanderstellung mit dem langsamen Satz in A-Dur noch verstärkt wird. Ganz in der Tradition von Brahms’ Violinkonzert, wo im letzten Satz ungarische Tanzrhythmen zum Zuge kommen, basiert das Finale Mackenzies auf einem polnischen Tanz, den Krakowiak (wie Dr. John Purser feststellte). Nach einer kurzen orchestralen Einleitung wird von der Violine das Hauptthema mit ihrem typischen synkopierten Krakowiak-Rhythmus in E-Dur gespielt, der während des gesamten Satzes immer wiederkehrt. „Je suis myope“, entschuldigte er sich, als er das Manuskript am Kamin aufbaute, während ich am anderen Ende des Zimmers Platz nahm. Nichtsdestotrotz hielt ihn aber seine Kurzsichtigkeit nicht davon ab, unbekümmert an all die technischen Schwierigkeiten heranzugehen und a prima vista in den Geist des Stückes einzutauchen […] Nach dem Schlußakkord folgte eine—für mich— irgendwie peinliche Stille. Dann streckte er seine Hand aus und bemerkte zu meiner großen Erleichterung: „Je n’ai rien à dire, rejouons-le encore“, was mir das bestimmte Gefühl gab, daß er wohl ziemlich viel zu sagen hatte. Das Konzert wurde am Abend des 26. August 1885 beim Birmingham Festival uraufgeführt und vom Komponisten selbst dirigiert. Das Werk kam besonders gut beim Kritiker der Musical Times an, der das „bezaubernde Spiel des Señor Sarasate“ lobte und Mackenzie „mit herzlichstem Beifall“ bedachte. In seiner Autobiographie schilderte Mackenzie dieses Ereignis als „einen Moment, dem ich den Beginn einer bis zu seinem Tode anhaltenden Freundschaft verdanke“.